Longtime local car dealer Ron Garrett shakes hands with new dealership owner Steve VanGorder. 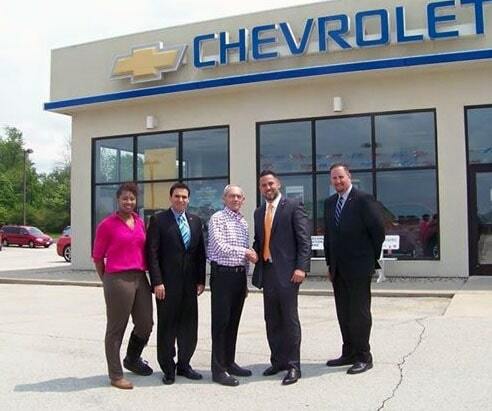 From left, GM District Sales Manager Jordyn Blandon, GM Zone Manager Manny Sosa, Garrett, VanGorder, and GM District Service Manager Steve Surman. GREENVILLE — People driving past 1225 East Russ Road in Greenville will soon see a new business sign. The Ron Garrett Chevy dealership was started in 1979 in Ft. Recovery, before relocating to Greenville in 1991. Though Garrett is retiring, VanGorder said the former owner will maintain an active presence at the business for the time being. “Ron promised me he would stick around to help out,” he said. Though the name will be changing — with new signs expected to be installed within the next month or two — VanGorder said that area residents can expect the same quality products and service they’ve come to enjoy. VanGorder has been involved in auto sales in the Dayton area for more than 20 years. Television viewers may remember him as the “Get in here!” salesperson featured in advertisements for Jeff Schmitt auto dealerships.